Last year we have upgraded our computers in our workstation offices in North London – Palmers Green. Since we don’t play any games, we thought this setup should be sufficient for our daily tasks. We run Windows 10 PRO, dual boot with Hardened Gentoo x64 and few Virtual machines (all with Debian). 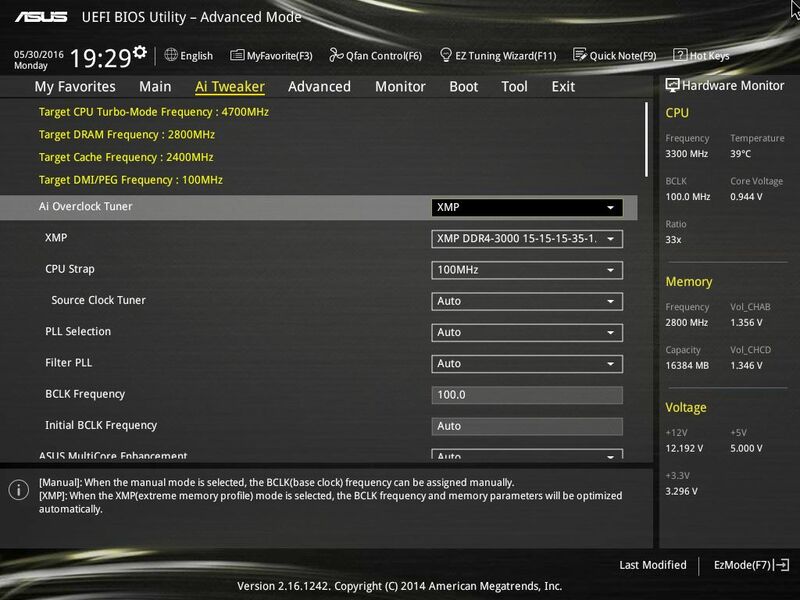 Remove all Asus OC software as we are going to do manual overclock in BIOS. Please make sure you have the latest BIOS. Also make sure your CPU cooler is sufficient enough to handle this beast. Set OC Tuner to XMP and CPU Strap to 100MHz. 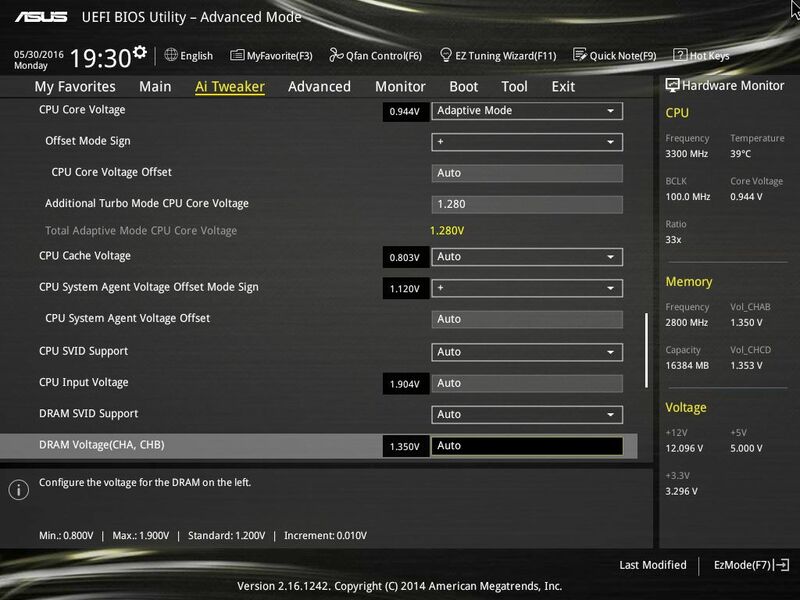 Leave anything else in this section on Auto as Asus motherboard will take care of anything else. 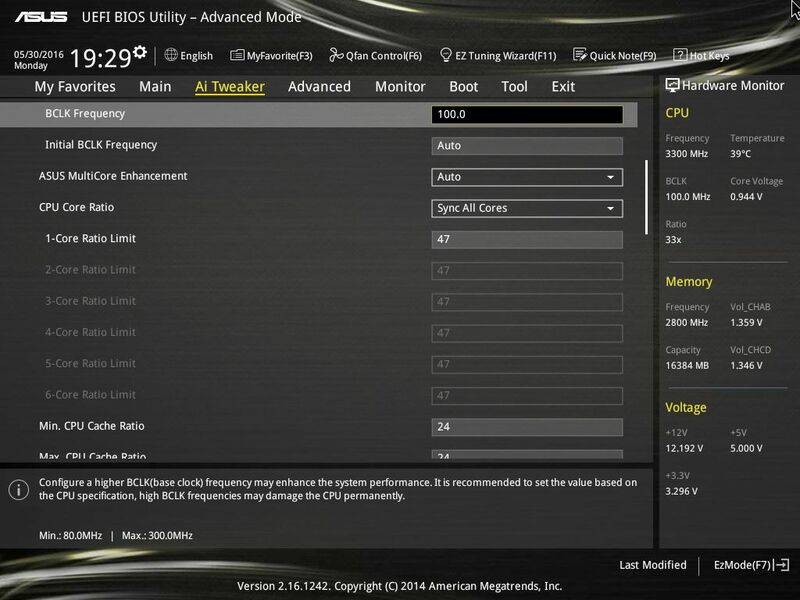 Scroll down in this section and make sure all voltage below are set to AUTO, there is no need to adjust them as our motherboard will set them up automatically and won’t go over the limits. Select Sync all cores from CPU Core ratio option. 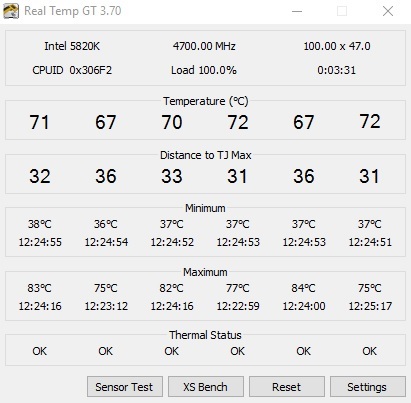 On Intel i7 5820k you can easily set this up at 40 at the beginning and start increasing it once you test stability of your OC. Most important step, setting Core Voltage of our CPU. Leave all other settings on AUTO as they will be set up automatically. 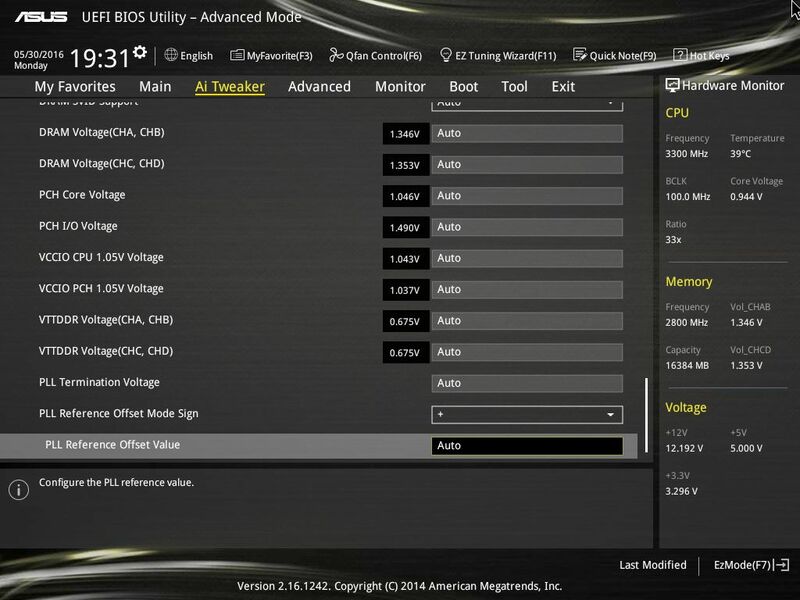 If you see CPU Input Voltage going above 1.950, then set it up manually at this value, or leave AUTO if it stays below. Now under Additional Turbo Mode CPU Core Voltage set at 1.290 at the beginning. Keep this value under 1.300 for 24/7 OC profile. Here we start to play and try to find the right balance between CPU multiplier, Vcore and CPU temps. Install Intel Extreme Tuning Utility for a quick benchmark. Set Vcore on value in step 4 and start increasing multiplier. Set CPU multiplier to 41, boot to Windows, run stability test with Intell XTU. This software will usually detect invalid settings right away, resulting in BSOD or restart. 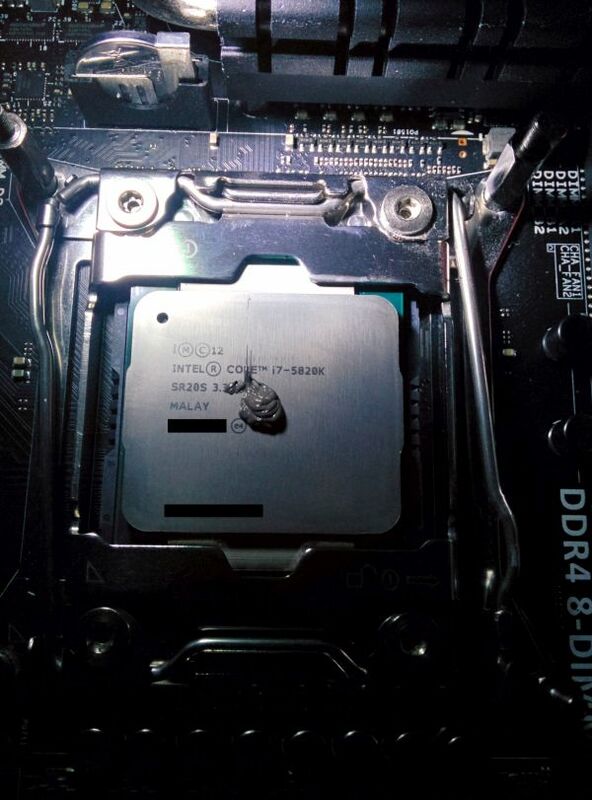 If you passed OC Test, boot back to BIOS, increase CPU multiplier and repeat the process. When you get Blue Screen, decrease CPU multiplier to last good settings. Repeat the test with Intel XTU and keep decreasing Vcore until you find your “magic” value. Once you find your “magic” numbers it’s time to do full stress test. Run Intel XTU and setup stress test for at least 5 hours. Use RealTemp to monitor your Core temperature. Keep Core temperature under 85C. Every chip is different, overclocking results may vary, but if your chip is capable of 4500MHz under 1.300v Vcore then you are lucky. 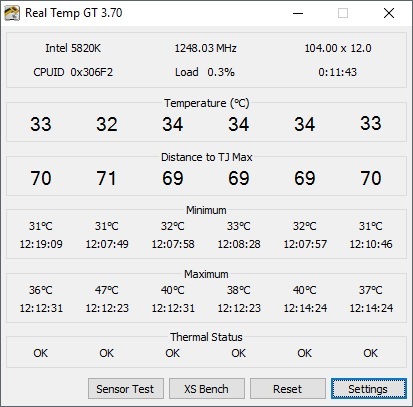 Below are few screenshots from CPU-Z and RealTemp (idle and stress). Good luck with your overclocking, let us know your results in comments below. When I Enable XMP, CPU strap change to 125Mhz ! Should I change it back to 100Mhz ? and should I change ram voltage ? Yes, change it back to 100Mhz, there is no need to touch memory voltage. Thank u 4 the fast reply. Because every one keep telling me that if I want to use RAM speed above 2666Mhz I have to change BCLK and STRAP from 100Mhz to 125Mhz (It’ll change automatically), or the system will not be stable ! I couldn’t overclock on 100Mhz BCLK and Strap with XMP enabled (3000Mhz speed ram), overclock failed even on booting. So, My pc now pass all stability tests at 4.5Mhz, 1.275v, XMP enabled 3000MHz, BCLK ans Strap 125MHz. that all what I changed and its going well. I really want to know what I have to do with Min and Max CPU Cache Ratio ? (when I enabled XMP, automatically Min and Max CPU Cache Ratio changed to 25 ), should I increase the Max cpu cache ratio ? 5820k X99eWS at 4.52Ghz x36 and 125.5 strap 2667MHz DDR4 (Kingston Fury). 1.305V CPU Voltage. 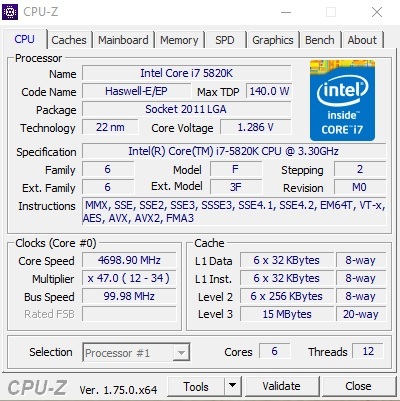 Scores 1308cb in cinebench. 40 degrees idle, 67 degrees full load. Watercooled. Why has the poster on this thread never replied on how he had obtained to have bclk set 100 on a x99 when every where on the net it is stated that is impossible without the bclk bumping from 100 to 125. This must be a troll.